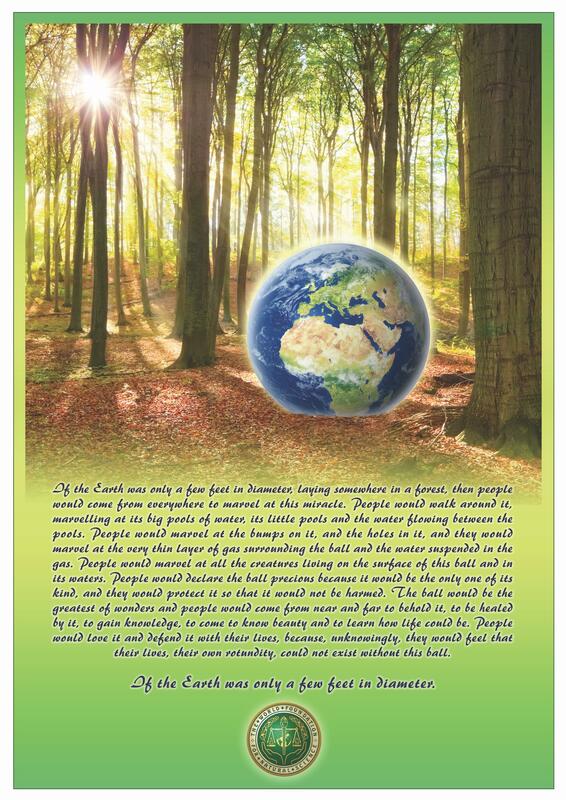 Since 1990, on April 22nd, “Earth Day” has been celebrated worldwide (in over 175 countries! ), and will be this year, too. In our hectic lives in particular, it is good to simply go out into Nature and become quiet. And yet: in the woods it is anything but quiet, because there is the noise of crickets and birds, and we hear the hustling of rabbits or the barking of a hind—the natural sound of the woods. But it is all part of the silence, and the life of the animals in the woods, and especially the birds and insects, mixes with that silence and even lifts up that silence. It is good to get to know Nature, because in Nature we see and feel the true nature of Mother Earth. We are then in God, we are then with God. Every breath we take is the breath of Almighty God. The fire in our hearts is the warmth of Almighty God that keeps us warm. We cannot, ourselves, make the water we drink. It is the water of Almighty God. We cannot make the earth in which we cultivate the plants and in which we plant the seeds. And there we have it; the fire, the earth, the air and the water, and we cannot make any of these elements ourselves …, any more than we can make love. And it is precisely from these four elements that our precious bodies are created, and we depend on the elements to live a healthy life. Let us not take this for granted, but let us be grateful to Mother Earth for what She unconditionally makes available to us every moment in great diversity. It does not pose a problem for Her to feed over ten billion hungry mouths. We simply have to start working with Her and stop exploiting Her in our short-term thinking greed and dumping our rubbish on Her body. It is our waste, and She does not want it. It is the environmental pollution that we have to take care of. We must stop polluting the air and water, littering the oceans and their inhabitants with plastic and destroying the soil and its vital internal life with toxic pesticides and insecticides. Climate change is part of the development of our Earth (which has never been static and never will be, because what remains in the status quo is dead!) and Nature always has a solution for such changes. This applies in particular to the service of the trees, which have the ability to hold the balance by providing shade, converting CO2 and causing rain, for example. This makes it all the more important that we protect the rainforests and immediately replace cut down trees. In this context, we would like to refer to the “International Arbor Day” 2019, which we celebrate on Friday, April 26, 2019, and we would like to encourage you to plant a tree on this special day as a homage to the special service that trees render to this Earth. It is man who gives life to the beings of the elemental world through the carbon dioxide he exhales. And it is the beings of the elemental world in the form of trees and flowers and bushes and grass that provide us with the much needed air to breathe by giving us back pure oxygen. May we learn to express that same steadfastness and selfless Love that Mother Earth has been expressing for aeons now. Together we can achieve heavenly conditions on this Earth again. But it begins with us, with our individual decision. Let us turn every day into an “Earth Day” by making ourselves daily aware of our actions and our (lack of?) appreciation and by setting to work for the Earth wherever and however we possibly can.